The most common solution I saw when a user had some problem with an Android application is to ‘uninstall then reinstall it’. Based on my experience and understanding, it won’t help anything and in most cases, it removes useful files or data assigned with the application when you uninstall it which, makes the situation even worse when you want to restore your profile. If your password is considered incorrect, try to use ‘Forgot password’ first. If the system tells you ‘The email is not registered with Cloudroid’, that means the email you are trying to login does not exist in our database at all. It is NOT your password that is incorrect, it is the EMAIL that is incorrect (which is why the game tells you ‘incorrect email or password’). Try to remember the correct email you used to register first. If you have tried all the means you can think of, contact me via cloudroid.system@gmail.com for a manual recovery. And remember, do not not not uninstall your game. It only wastes more of your time. I have fixed the mail server. Now it can send password reset email to Yahoo mail users as well. We will have a major update to all the games tonight. After update, you will find the authentication system is completely changed. User account is bound to his/her own phone device. Each account is identified by the bound phone’s IMEI number. One phone can only have one account registered in its lifetime. User is NOT bound to phone anymore. Users are using email+password to register and sign in. Once you sign in successfully, the phone will remember your account so you don’t have to type password every time. However, the phone is not bound with account anymore. This change is to allow Tablet users who do not have IMEI numbers to join our game community as well. 1. Click ‘Get Started’ on the screen. The phone may still display your old account’s info when you first open the game. Simply click on it and you will see it say ‘Incorrect password’ and change to ‘Get Started’. 2. 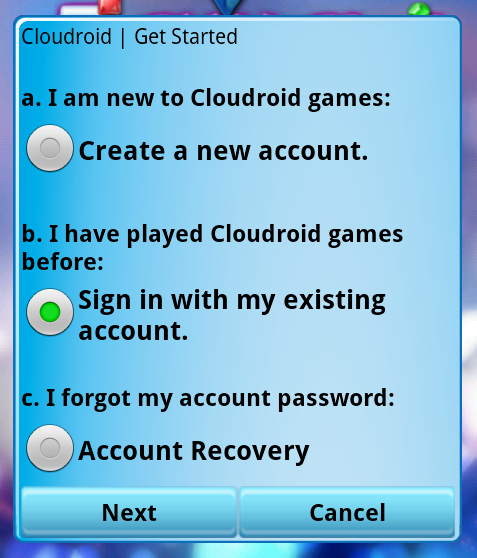 Choose ‘Sign in with my existing account’ if you have played Cloudroid game before. Otherwise, create new account. This means the server has found an existing account bound with your phone. If the showing account belongs to you, simply input password of your account, then pick an email account as your new account then click Sign in. Note: the email address is very important. Make sure you have a valid email input. All your future operations related with your account will require your email address. Also, once input, you cannot change your email. You will have to contact me directly to change it which, might take years to finish 😛 So, put valid email here. 5. If your password is correct and your email hasn’t been used by any other users, you should see the game view now. And the phone will remember your account so next time you can do one click sign in. 6. Once you have signed in, your account has been successfully converted. Which means: You do not have to go through the same process ever again. Next time when you install a new game, or reinstall this game, you can only choose ‘Use my email to sign in’ and type in email and password to sign in. What if the phone didn’t find my previous account? Then you will see a different view at step 4, which tells you that no account was found in the database. This is usually because you had an account with Cloudroid but you changed your phone and didn’t bind your account to new phone. What you have to do is, find your old phone’d IMEI number which was bound to your old account. Input that IMEI number on the screen, then type password and email address and you should be able to sign in. What if I uninstalled the game AFTER I have converted my old account? What if I am totally lost and really need help? I have received a lot of comments from users who wanted to play Cloudroid games on Android tablets and due to lacking valid IMEIs the games failed to authenticate with server. This problem will be solved soon in the next update in about 2 weeks. Coming with the update are several other new features including a Practice play mode for Jewels Online, Blocks Battle Online and Linlink Online. With the new play mode, after a game room is created, the game will automatically start in practice mode which you can keep playing the game by yourself until a player joins your game room and the real battle starts. After you finish a game with your opponent, if he/she leaves the room, you can still choose to enter practice mode again. This helps players to kill boring waiting time for an opponent as well as giving an opportunity for beginners to practice their gaming skills. Another big update for the game is the support for multi-language. With the update, Chinese will be fully supported in game. By changing the display language to Chinese (Simplified or Traditional) in Android phone’s setting, the game will automatically change to Chinese version the next time you open it. This will not affect current English language users though. For the chat rooms, there will be one International chat room for all language users, providing a channel for users in different languages to communicate. Other than that, the users can only see chat rooms with his/her own language, e.g., Chinese users cannot enter an English language chat room (the room will be invisible to them). User search function so you can search online users by user id or user name. Update game file by using file downloading from game server directly instead of using Google Market. This helps those users without Market on their phone. With updated game versions released today, all games now have ‘Chat Rooms’ implemented aiming to reduce game lags and provide better chat managements. To chat publicly, enter a chat room. You can choose chat room based on chat topic, moderation level and capability. You can exit chat room, or join another chat room at anytime. One user can enter one chat room at one time. Whenever a game starts, the user will exit chat room automatically. This will provide better gaming performance. Mildly moderated chat room has a more freely chat style while highly moderated chat room will enforce Cloudroid Community Agreement strictly. If you don’t like the restrictions, please go to mildly moderated chat room. Shortcut to your chat room: Press ‘MENU’ button, click ‘Chat Room’. Chat screen scrolling too fast, making it difficult to read chats. Unable to exit public chat to reduce network traffic for players who are more focusing on gaming. Waste server networking bandwidth by sending each public chat to every online player. However, considering the public chat is one of the most active game features for Cloudroid community where a lot of people are having great fun out of it, I want to be more careful when I change it and ensure the new design benefits the majority. I am posting my design plan here for you to judge. Feel free to vote for it. Also, providing a detailed comment with in-game user id will be rewarded. Change the current Public Chat tab to Chat Rooms. When user clicks Chat Rooms, the game shows a list of system created chat rooms in below. The graphics are similar to the way of displaying game rooms. Once a user clicks one of the chat room, he/she will join the room (if the room is not full). Chat room capability can reduce the number of people in one room and thus help reduce the fast screen scrolling problem. Once a user clicks another chat room, he/she will leave the old room and join the new room. When the user is in a chat room, he/she will continuously receive real-time chats from which room he/she is currently in. The user won’t receive any chats from any other chat rooms. The user can leave the chat room at any time. Once left, he/she is out of public chat rooms and will not receive any public chats from any room. The user can play and chat at same time. If the user doesn’t want to receive chats during a game, he/she can leave the chat room. This can reduce network traffic and decrease game lags dramatically. If you have any comments, write it here including your in-game user id. Thank you.